Lightweight, versatile and durable billets made from aluminum. Metal billets are FAST, and this lightweight model is what we use for trimming and cleaning and light flintknapping around the shop. 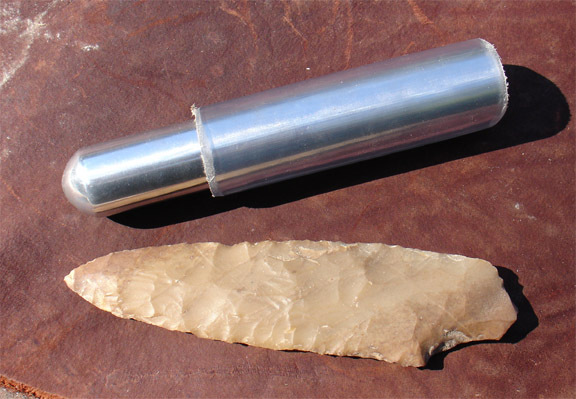 Metal billets can save your arm if you do a lot of flintknapping. Metal percussion billets behave differently from antler, are not historically correct, but may be easier for beginners and professionals. Aluminum billets work well on heated novaculite and other easy-to-knap materials. Especially good for smaller knapping projects up to 4 inches. Click here for instructional information on using metal billets. 6 1/2 by 1 inch with domed tip. Ready-to-use.